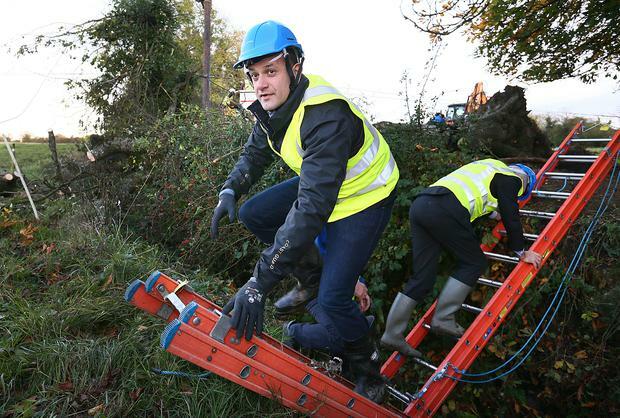 Taoiseach Leo Varadkar waded through the mud of a County Meath field to thank ESB Networks crews for restoring electricity to blacked out communities. 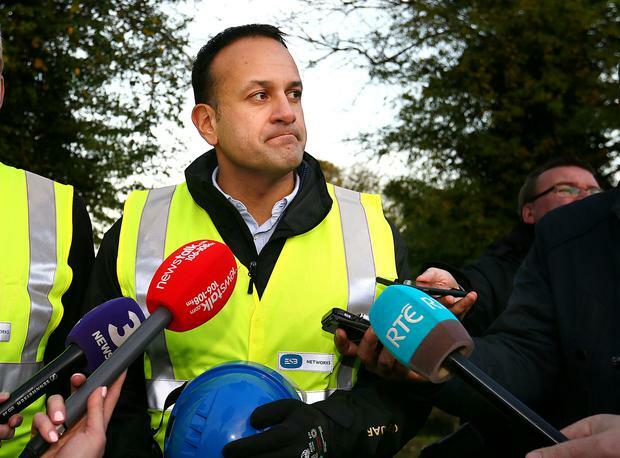 In a pair of black wellingtons and a helmet, the Taoiseach watched as work crews lifted fallen power lines from a sodden field in the town of Drumlargan, near Kilcock. 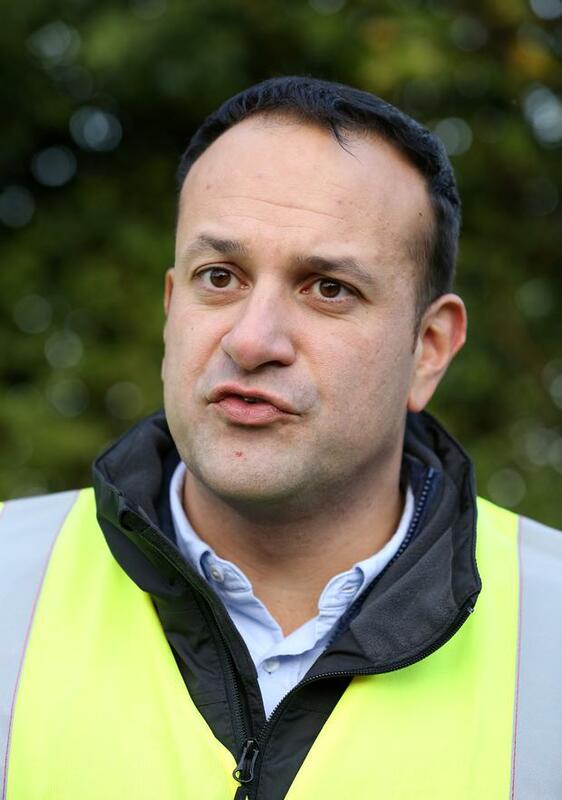 Speaking to reporters at a muddy gateway, he paid tribute to the huge nationwide repair operation underway in the wake of Storm Ophelia. 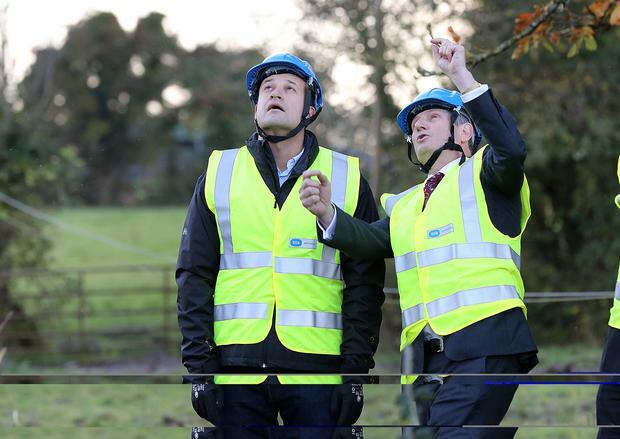 "I wanted to see with my own eyes the scale of the damage and witness the phenomenal work that is being done by ESB staff, staff of local authorities, defence forces, and others," he said. "More than half of people who lost power have had their power restored. The vast majority of people will have power restored in the next three to four days," he said. He said it was possible some people might remain without power for up to eight days. He was briefed at the scene by Pat O'Doherty, chief executive of the electricity company, and John McManus, regional operations manager. Mr Varadkar said help was on the way for Ireland from abroad. "A lot of extra support is coming in. Once the repairs are done in Scotland and England and France, people will be coming in from those jurisdictions to help out our crews. And the Defence Forces are helping out as well," he said. "Today, is very much about the clean up and repairs," he said. He denied that international workers could have been brought in earlier as those workers were needed in their own countries. The storm only became a national red warning at 1pm on Sunday, he said. He was asked whether there should be a new criminal offence covering people who defy public warnings and conduct dangerous activities near or on water at a time of weather alerts. "I think it is something that merits consideration. People who disobeyed the red alert travel warnings yesterday did not just put themselves at risk, they also put at risk the lives of other people, but particularly our emergency services," he said. "But I'd never rush into creating a new crime. It is something we would have to consider and I would suggest in the Dail we look at it on an all party basis," he said. Regarding the repairs, he said some 400,000 homes lost power supplies and more than half of those were restored. "Everyone will know tomorrow when they are going to be reconnected," he said. Ireland did not suffer sufficiently to qualify for special EU funds for repairs. In terms of the cost of the damage, he said "We don't know yet. When it comes to the ESB, they have significant resources. Local authorities will need further assistance and they will get additional funds for the clean up. "Unlike flooding, though, there doesn't appear to be significant damage to the roads. Previous weather events meant the big damage was to roads and the need to repair roads and flood defences so actually it may turn out to be the case the cost of carrying out all the repairs will not be as great as feared yesterday," he said.